Why do we have Spiderlift cherrypickers? Why do we have Spiders? History shows us that working at height had to evolve to become quicker, cheaper and more importantly safer. This entailed moving on from old wooden ladders, wooden gantries and trestles and of course, hanging from ropes. No…not the around the neck type but around the waist or siting on a sling. We have now progressed to strong alloy ladders, alloy or steel scaffolding, rope access technicians (with purpose made equipment) and of course access platforms. Most are self-explanatory, but what is an Access Platform? Simply put, an access platform is a temporary work platform attached to the end of a boom and is manoeuvred into position via a system of hydraulically operated arms/booms. • Cherry Picker - used by most as a basic description of all access platforms. • Scissor Lift – a four wheeled vertical platform known by some as a 'flying carpet'. • Boom Lift - a general term for four-wheeled self-propelled boom type machines. 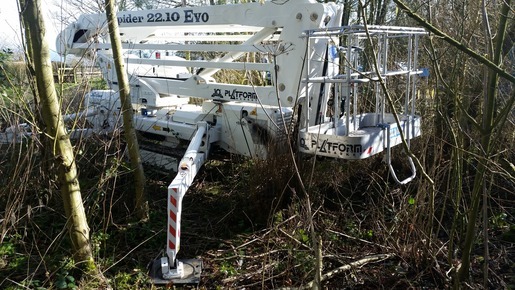 • Spider - a term used for a tracked access platform with outriggers. • Trailer Mounted – a road towable platform that can be towed behind a car. • Truck Mounted – a platform which is fitted to a vehicle chassis. • Vertical Boom - a term used for stock pickers or manlifts. 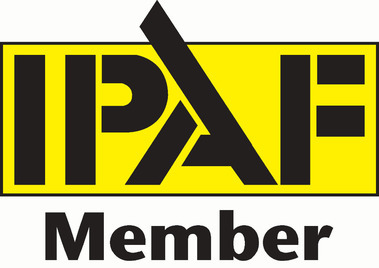 • MEWP - Mobile Elevated Work Platform, the descriptive term. 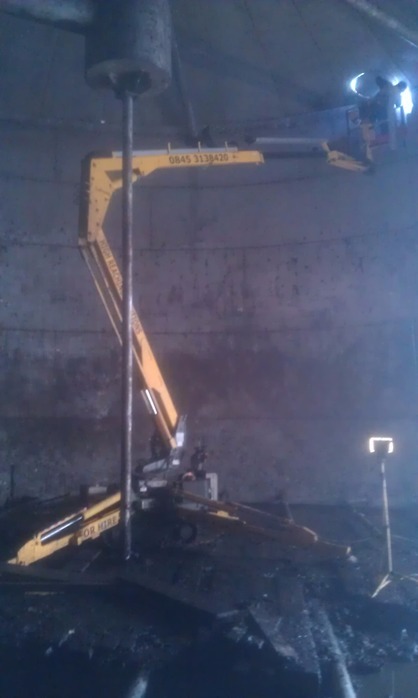 High Reaching Solutions, established in 2008 and based in Rillington, near Malton (between York and Scarborough), chose to specialize in tracked spider access platforms, which evolved through the necessity of getting an access platform into awkward areas and like other types of booms they come in a variety of sizes and configurations. Our own Platform Basket tracked machines, Scarlett Grace (Spider 13.80 Hybrid), Sabrina (an RQG150), Sophie (Spider 18.90 Pro) and Selina (Spider 22.10 EVO Hybrid), have been in some very awkward and challenging situations. Scarlett Grace has worked from a mezzanine walkway in a factory in London, Sabrina once lounged on garden decking in York, been inside a recycling tank in Hull and tracked through seaweed on the beach near Robin Hood’s Bay, North Yorkshire to get to the job. Sophie had to negotiate a steep and very awkward path at the side of a canal in Huddersfield and Selina had to deal with difficult wooded terrain at the top of Oliver’s Mount in Scarborough. All four ladies have dealt with very narrow and awkward gaps and have worked inside buildings on delicate flooring. Their clients have always been extremely happy with their performance, abilities and reliability and have often requested them back by name. Giving our ladies a ‘personality’ makes our clients smile and they certainly do look after the girls with great respect, they don’t come back covered in concrete, paint or general dirt. 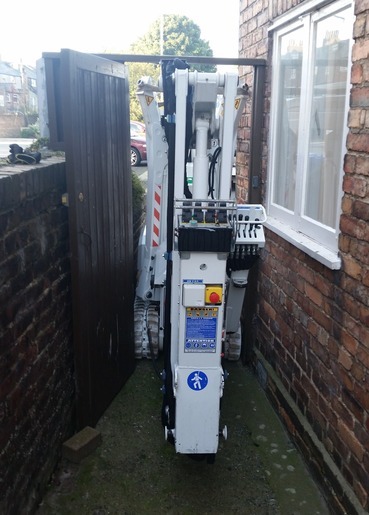 Spiderlifts have great qualities, light for their size and being on tracks gives them a low pressure floor loading, narrow when stowed allowing them to go through narrow gaps, normally less than 2 meters in height and very easy to use controls. Using their outriggers/stabilizers they are able to ‘set-up’ on soft, uneven or sloping ground. Other qualities on some models include remote control, dual power options, battery power options, dual tracking speeds, track widening systems for stability on rough terrain, cage rotate, adjustable stabilizer footprint settings, automatic outreach control, automatic cage load control and air, water and power supply to cage. 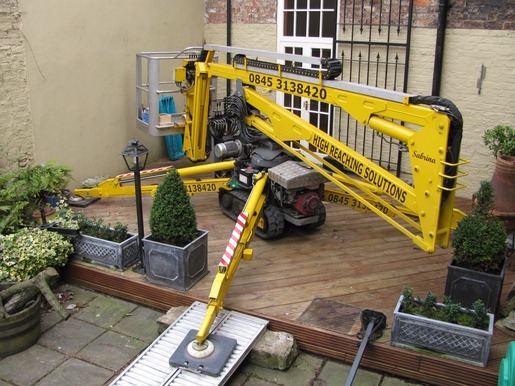 I know it sounds like an advert but those are the qualities of a tracked spider access platform or spiderlift. And it’s these qualities that allow these machines to be extremely versatile, and therefore challenging. This brings great satisfaction when you’re able to achieve what others deem to be impossible.